We are able to offer Protective Behaviours Taster Workshops, 1-day Introduction, 2-day Foundation, and 4-day Specialist Practitioner courses as well as a Train the Trainer course that has a training component followed by an apprenticeship-style induction. 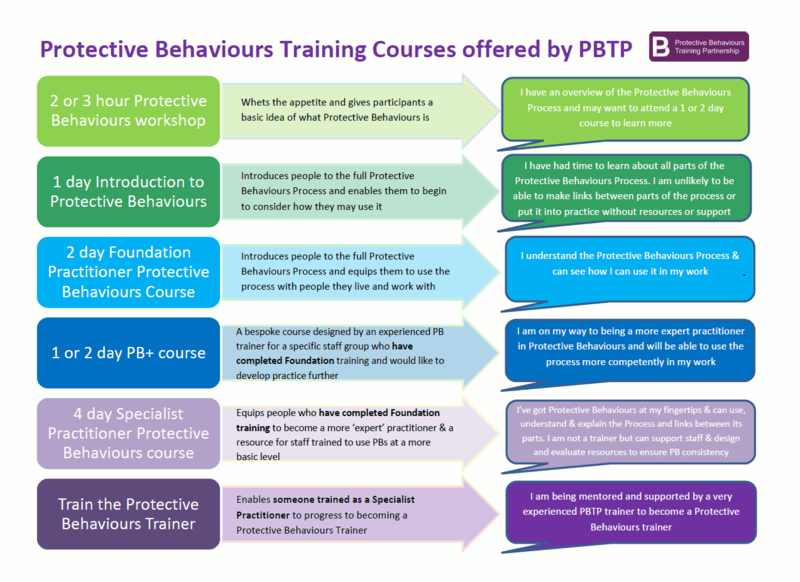 Trainees who have succesfully completed Protective Behaviours Training Partnership courses are able to access further course-specific resources through the log-in facility. They are also kept informed via a newsletter of upcoming training events should they wish to further their PBs knowledge and experience. We are also able to design bespoke programmes - previously these have ranged from the use of PBs with babies, communication in the workplace, applying the PB process with people who seek asylum, using PBs with children and young people in transition, working with children with vulnerability and helping families to understand and use the Protective Behaviours process. Recent additions to our menu of PB-based courses include How to use Protective Behaviours to elicit the Voice of the Child and also Protective Behaviours as a Child Sexual Exploitation Intervention. To see research carried out by The Family Matters Institute into the effectiveness of attending training in Protective Behaviours lead by the PBTP, please see their research report here. It gives us great pleasure to know just how much difference our training makes to both the personal and professional lives of those attending. If you would like further information on training please contact us and we will get back to you shortly to discuss possible options.